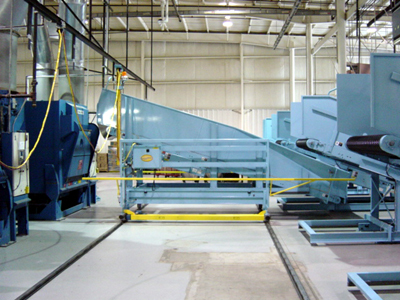 The Gardner Shuttle Conveyor transports goods from the washers to the dryers in a hands-off operation, which is a labor-saving, safer, and time-efficient process. When the washer-extractor finishes its cycle the shuttle conveyor moves to the washer unloading position. The washer tilts forward and empties its load onto the Shuttle Conveyor, which then moves to a dryer that has signaled that it is idle and is available to receive a load.